A brand-new Construction Industry Scaffolders Record Scheme (CISRS) Overseas Scaffolder Training Scheme (OSTS) centre based in the Rosayl region of Oman will open for business early in 2018, following a successful pre-accreditation visit carried out by Dave Mosley the Scheme Manager. This venture will be the 2nd Partnership for UK Provider Safety and Access Ltd within the region and will complement their other facility located in Nizwa. The new centre will be operated in collaboration with local company Knowledge Grid LLC who already offer a wide range of both Health and Safety and practical training and qualifications including Nebosh, IOSH, Lifting and Hoists. During the visit CISRS and Safety and Access took the opportunity to meet with some of the local stakeholders such as Petroleum Development Oman (PDO) and the local accreditation body. Presentations were delivered to highlight the OSTS training content and the growing success of the international scheme overall. PDO have agreed to include a requirement for CISRS OSTS qualification for their future projects within the region. The biennial NASC Health & Safety Awards were presented by Karren Brady CBE, business woman, football director, and star of TV’s The Apprentice, and Des Moore, the newly appointed NASC President, and CEO of the TRAD Group, in front of a packed audience of members and guests attending the NASC AGM at the Intercontinental Park Lane, London on Friday 24 November 2017. The awards are a well-established part of the NASC calendar, and are highly-prized. 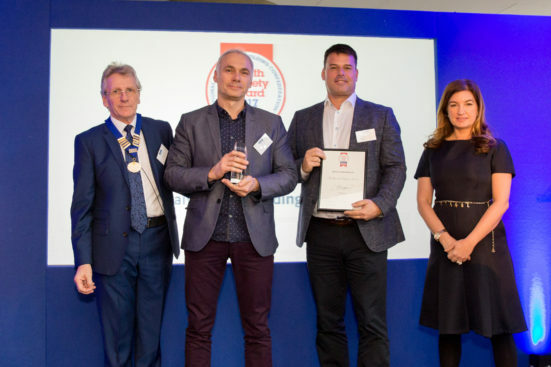 Contracting members of all types and sizes are urged to submit entries for the awards, and this year, in order to encourage more smaller organisations to enter, the award was split into two categories, 1-66 Employees and 67+ Employees. A total of nine entries were submitted across both categories. 1. Demonstrate how directors and senior management have taken an active and leading role in promoting health and safety in their organisation. 2. Show how the organisation investigates health and safety incidents (and near misses) also how lessons learned are implemented. 3. Show how the organisation works in accordance with guidance outlined in SG4:15, with provision of examples to demonstrate how this is promoted to the workforce. 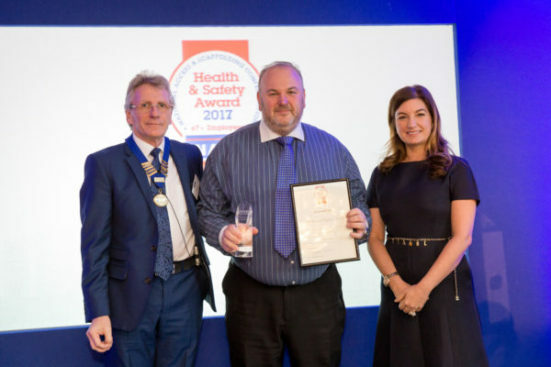 Before announcing the winners, Adrian Rooney (Midland Scaffolding Services Ltd, and Chair of the NASC Health & Safety Committee) noted that this year’s NASC 2017 Safety Report had once again demonstrated that member contractors continued to out-perform the industry, and that member accident statistics had fallen for the tenth year in a row. Mr Rooney then announced the winners and highly commended entries for the NASC 2017 Health & Safety Awards, and invited member representatives to receive their trophies and certificates. Mr Rooney thanked the award judges Roy Rogers (Interserve Industrial Services Ltd) and Simon Hughes (Simian Risk Ltd) for carrying out their exacting task, and noted that competition for both categories of this year’s awards had been extremely tight. ‘The submissions demonstrated a high level of performance, well-developed occupational health and safety management systems and culture, outstanding risk management controls and monitoring to ensure compliance.’ Roy Rogers, QHSE Director, Interserve Industrial Services Ltd.
‘The strength of the submissions was a very strong and close-run affair, but after careful consideration, the winners who clearly demonstrated all aspects of best industry practice, prevailed. ‘I would not only like to congratulate the winners and highly commended entries, but all candidates for the excellent standard of their applications.’ Simon Hughes, Simian Risk Ltd. 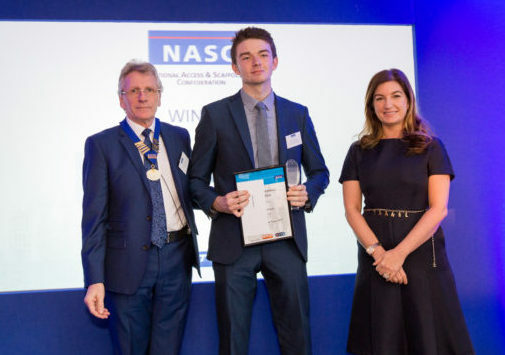 In conclusion Mr Rooney noted that award winners and highly commended entries would be entitled to sole use of a bespoke NASC logo on their corporate stationery and websites. Interlink Scaffolding Ltd (Birtley, Tyne and Wear) was presented with the NASC 2017 Scaffolding Project of the Year award by Mohed Altrad, CEO and President of the Altrad Group, in front of an audience of more than 500 members and guests attending a glittering NASC Annual Ball at the Intercontinental London Park Lane on the evening of Friday 24 November 2017. The evening had commenced with a speech by Des Moore, newly elected NASC President and CEO of TRAD Group, who had welcomed all present and briefly reprised the speech which he had given earlier at the NASC AGM. The scaffolding project award was keenly contested, with just three points separating the first three (of twelve) entries. In the view of the judges, Interlink’s New Wear Crossing, Sunderland submission was declared a worthy winner. ‘Interface with the client’ was one of the key criteria for judging the entries, and in this respect the submission from Interlink scored highly. 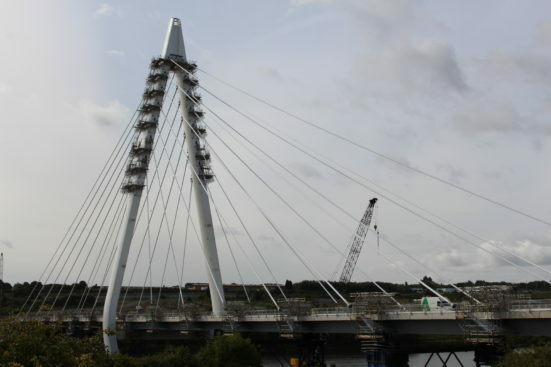 The judges were also extremely impressed by the degree of off-site preparation prior to erection of the bridge structure, complete with scaffolding. Darren Maratty, MD of Interlink Scaffolding, was delighted to receive the award on behalf of his company. He commented on the complexity of the project, and noted that it had attracted considerable press interest and wider recognition in the construction sector. 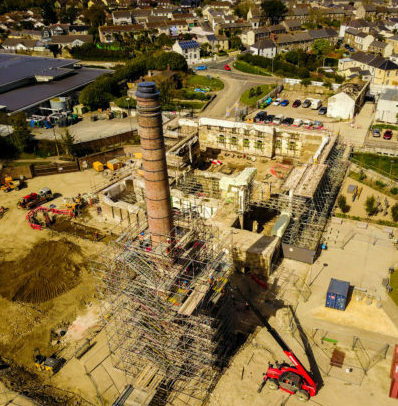 The Runner Up for the award was Chris Sedgeman Scaffolding Ltd (Penzance) for their Kresen Kernow, Cornwall submission. Trad Southern (London & SE) was awarded Highly Commended for their 100 Liverpool Street Station submission. The judges for the award were Mark Castle (Mace), Katrina Dowding (Skanska) and Dean Summers (Berkeley Group) all of whom were thanked for their contribution. Mr Summers commented: ‘It is great to see the scaffolding industry continually improving in so many areas’. Altrad Group had generously donated an impressive cast acrylic trophy for the award. The acrylic was engraved with scaffolding, and incorporated a polished nickel-plated aluminium base with a replica of the Wellington Arch. Smaller versions of the trophy were presented to the winner and the runner up. The award presentation had been preceded by a speech by Mohed Altrad, founder of the multi-national Altrad Group. Following a brief introductory film he outlined his personal story from humble beginnings in Syria, noting that he had been fortunate to benefit from an opportunity to study in Montpellier, France as a young man, where he began to develop his construction business. He then praised the work of the NASC, noting that it makes a huge difference to the safety of operatives working in the construction sector, and urged all present to provide opportunities in their own businesses to people from diverse and different backgrounds. Des Moore thanked Mohed Altrad for his personal and inspiring life story, which had clearly resonated with those attending the ball. Mindful that he had a ‘captive audience’ of wives and other halves, he then stressed the importance of encouraging and mentoring more women into senior positions in the NASC and the scaffolding industry in general. This was one of his four key objectives for his presidency, all of which focused on inclusivity. Mr Moore concluded his speech by thanking all those who had contributed to the day’s events, in particular Baroness Karren Brady CBE for her inspirational presentation at the AGM. Dave Mosley NASC Director of Training and CISRS Manager was in attendance at the NASC AGM on Friday 24 November 2017 to announce the winners in the NASC Apprentice of the Year Awards 2017. Competition for the awards which are co-sponsored by Construction Industry Scaffolders Record Scheme (CISRS) and Construction Industry Training Board (CITB) was tough, and after reducing the submissions to a shortlist of 8, the judge for this year’s competition, Paul Gaze of CITB found it too difficult to recognise the achievements of only 2 apprentices and suggested an additional ‘highly commended’ category. Three apprentices stood out when Paul reviewed the shortlisted submissions. All three had showed the desire to succeed and had overcome various challenges on their respective CISRS programmes. The overall winner of this year’s award was Aidan Waldron (see above image) of Connect Scaffolding Ltd based in Bishops Stortford. 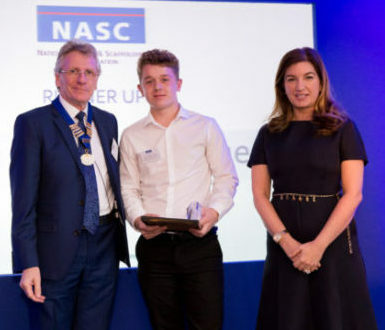 He was presented with his Trophy, Certificate and cheque for £500 by Des Moore, the newly appointed NASC President, and Baroness Karren Brady CBE, business woman, football director and star of TV’s The Apprentice. His employer Connect Scaffolding also received a trophy, certificate and cheque for £500. Tiger Fedrick-Hughes of Tamworth Scaffolding Ltd was awarded the 2017 Runner Up prize which saw him and his employer receive a trophy, certificate and a cheque for £250 each. Tiger was previously working in another construction trade but felt that he was not developing his career. He since joined Tamworth Scaffolding and has excelled on his CISRS programme. His attendance and commitment are first rate, and his achievement at college is very good. The Highly Commended award went to Claudia Ferguson of Interlink Scaffold Limited (ISL) based in Birtley Tyne and Wear. It was a highly successful day for Interlink and their workforce as the Wear Crossing job went on to win NASC 2017 Project of the Year Award which was presented by Dr Mohed Altrad founder and president of the Altrad Group who sponsored this special award. NASC and CISRS would like to thank all of those involved in these awards including sponsors, employers and in particular the apprentices as these are the people who will take the industry into the future, well done to all. The NASC AGM was held at the Intercontinental London Park Lane on Friday 24 November and saw the election of a new NASC president Des Moore (CEO Trad Group) in succession to Alan Lilley (Commercial Scaffolding Ltd) in front of a packed audience of 160 members, guests and staff. In his welcoming speech Mr Moore thanked Mr Lilley for two years of exceptional service, and noted his contribution to growing the SME membership, also mentoring smaller organisations to achieve compliance with NASC criteria. 1. Increase the pre-requisite for NASC membership by main contractors, developers, and national and local government agencies in tender documents. 2. Strike the right balance between the needs of both large and small companies. 3. Create mentoring and training schemes for all categories of staff, old and young. Academically gifted and those not so lucky. 4. Encourage and mentor more women into senior positions both in the NASC and across the industry in general. Mr Moore discussed the wider importance of growing the NASC membership, as this would increase the positive influence which the confederation had over the industry, and assist with promoting and achieving core aims, the most important of which was a safer industry. He added that he intended to run a specific and targeted marketing campaign during his two year term as NASC president with a view to promoting the use of NASC members only for all projects, large and small. He continued by speaking about the need to meet the needs of both small and larger member companies, noting that the voice of smaller companies should be heard and their contribution recognised, but cautioning that the importance of larger members to NASC membership should never be under-estimated. The NASC would be proactive and ensure that it got its message across to all companies, and encourage them to be active within the NASC, noting that the confederation would be improving its communications and marketing with a view to raising the profile of the NASC. 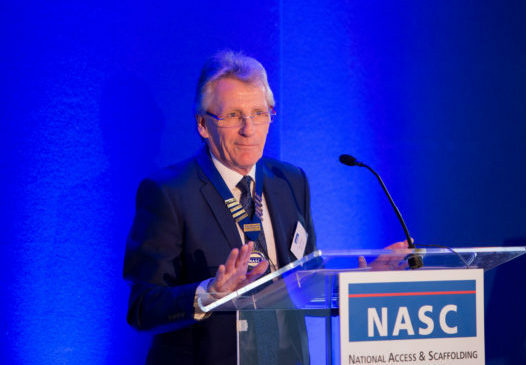 Mr Moore stressed the importance of the NASC to the industry, noting that it was a true industry trade body with a rigorous audit process, and high standards for entry and retention of membership. The confederation had a proud record of improved accident statistics over very many years, which had helped to save lives and livelihoods. The organisation would continue to evolve and would aim to help companies to get better at what they already did by being more responsive to the needs of members and communicating clearly and vigorously on all fronts. Mr Moore then went on to discuss his next objective, outlining his own personal journey within the industry and noting that his lack of personal qualifications had not prevented him from progressing to the role of CEO of the TRAD Group of companies. 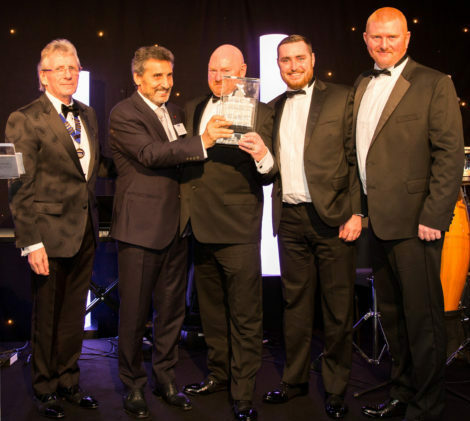 Trad Group had a combined turnover of more than £100 million and employed over one thousand people, and was a key subsidiary of the worldwide privately-owned Altrad Group, whose owner and president Mohed Altrad would be presenting the NASC 2017 Scaffolding Project of the Year Award following his speech at the NASC Annual Ball in the evening. He urged all present to encourage staff and operatives who had few or no academic qualifications to remain in the industry and pass on their knowledge and experience, and provide mentors to help them progress into support functions and management roles within their companies. He stressed the importance of encouraging more young people to enter the industry and represent their companies on NASC committees, noting that greater diversity brought with it new ideas, knowledge and fresh perspectives. This was vitally important given the current CITB re-structuring exercise and the recent decision to outsource all training courses by the latter part of next year. He commended the CITB ‘Construction Ambassador’ scheme (of which he was a member) and urged those present to consider joining. He then touched on the ongoing ‘Mind Matters’ campaign in the construction press, noting that the mental and emotional health of the construction industry workforce could not be ignored, not least because it accounted for a third of the industry’s absences. He personally had suffered a full breakdown earlier in his career and he was indebted to his wife Debbie for the support she had given him. He had learned valuable lessons from this experience and he urged everyone in the industry to assist in whatever way they could to raise awareness of mental health issues. In conclusion Mr Moore commented on his objective to encourage more women to pursue careers in the scaffolding sector, and particularly to participate on the various NASC standing committees. He noted that at TRAD women had been encouraged and mentored and had gone on to excel in senior positions such as surveying and estimating, supervision and contracts management, and were now represented at board level. In connection with the above Mr Moore then congratulated Lynn Way of Chris Sedgeman Scaffolding Ltd and Chair of the NASC South West and South Wales region, on her appointment to the role of Vice President at the NASC AGM. This was a significant step forward in a predominantly male organisation, and he hoped that it would trigger greater involvement by women on the many and various NASC standing committees and working groups. Mr Moore then introduced Baroness Karren Brady CBE as the guest speaker at the AGM, noting that she had done much to champion women’s interests in business generally. Baroness Brady outlined her own journey in the male-dominated world of football, stressing the importance of having a strong work ethic and determination. She discussed the challenges faced by organisations looking to attract skilled young people into their businesses (and retain them) and offered some pointers which might assist members in achieving this. 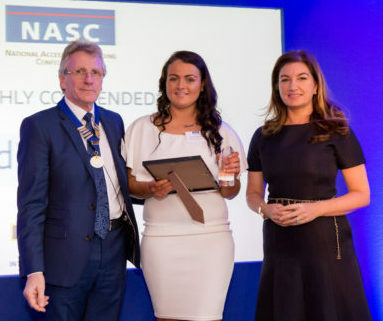 Baroness Brady concluded her presentation by answering questions from the floor, and went on to present (appropriately) the NASC 2017 Apprentice of the Year Award, won by Aidan Waldron of Connect Scaffolding Ltd.
She then presented the NASC 2017 Health & Safety Awards, which were won by Malvern Scaffolding Ltd (1-66 employees) and Actavo (UK) Ltd (67+ employees) respectively. Mr Moore thanked Baroness Brady for her inspiring presentation and urged those present to read her book ‘Strong Woman’, copies of which were available for delegates to take away with them following the AGM. He commented that the confederation was extremely fortunate to have two inspirational speakers across both NASC events (AGM and Ball) noting that Mohed Altrad would be speaking about his own personal journey at the Ball in the evening, and that copies of his book ‘Badawi’ were also available for delegates to take away with them following the AGM. He thanked his wife Debbie for her support throughout his career in the industry, and ended his speech by reiterating the need for members to recognise the abilities of the people in their businesses and give them the opportunities they deserved. In conclusion he thanked all those who worked so hard on the various NASC standing committees and Council, and thanked the NASC staff for their tireless efforts and support. We are delighted to announce two special guest speakers at the Annual General Meeting and Ball this year. Baroness Karren Brady, CBE is a well-known business woman, and now TV personality and columnist. Having built her career in the male dominated world of football, Karren is a champion for women in business, skills and diversity. Her appearance at the AGM hints at the NASC’s key objectives under the new president, Des Moore’s tenure. Like the wider construction industry, the scaffolding sector has a poor record in attracting women into both on an off site roles, and also faces challenges in attracting and retaining skilled young people. The evening event will also feature Dr Mohed Altrad, the Syrian-born French entrepreneur and Founder/CEO of the Altrad Group. Dr Altrad has faced many of the challenges and opportunities that the business owners in the NASC community frequently contend with. As a successful entrepreneur who has made a considerable investment in UK construction businesses, his appearance reflects the NASC’s commitment to helping its members of all sizes grow their businesses. The awards will be presented across both the AGM and Ball. 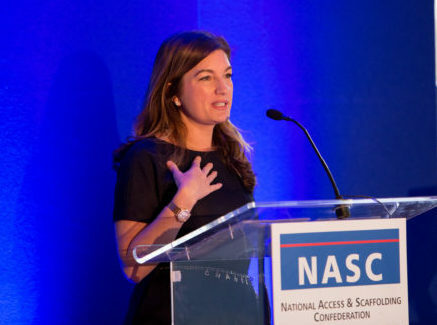 Baroness Brady, who is currently appearing in the BBC One Series The Apprentice, will present the NASC’s Apprentice of the Year Award, while Dr Altrad will present the new Project of the Year Award. 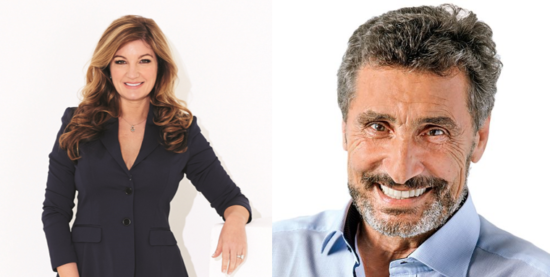 “We are thrilled to host Karren Brady CBE and Dr Mohed Altrad at this year’s AGM and Ball. These speakers were selected to join us as their own stories resonate with the objectives of our trade body and with the journeys of many of our membership. We hope by sharing their collective wisdom it will challenge us all to make the most of our own lives, talents and businesses”. Registration is open for members of the NASC to attend the Annual General Meeting. This year promises to be a great event with guest speakers and new awards to celebrate and recognize the achievements of our members. However, the Annual Ball sold out in record time so a waiting list is in place for any members wishing to purchase tickets. We are very pleased to announce that the NASC is now a Registered Member of Safety Schemes in Procurement (SSIP). Earlier this year the decision to apply for SSIP accreditation was made as it was felt this would add real value to the membership, and over the summer a plan was implemented by the NASC to achieve accreditation. A working party consisting of NASC President Alan Lilley, NASC Audit Committee Chairman Mel Archer, NASC Auditor Alastair Mackenzie, NASC Membership Manager Jamie McGuire, and external consultant Darren Male (Quensh Consultancy) was set up to review the Health & Safety section of the NASC audit process and make the necessary improvements in order to comply with PAS 91 Criteria, which is the standard for construction related procurement and pre-qualification questionnaires. As part of the improvements required by SSIP, the audit process was moved entirely online to make the submission of information easier for the contracting company, and easier for NASC to assess the information. Following successful audit by SSIP and subsequent integration of information to the SSIP Portal, membership was recently confirmed in October 2017. NASC Audit Committee Chairman Mel Archer also commented “The Health & Safety section of our audit was already focusing on a lot of the PAS 91 Criteria, which is required by SSIP in order to become accepted for membership. We recognise that in this everchanging industry we must always look to improve our audit process, and in becoming an SSIP Registered Member we have achieved this. We have also employed a Health & Safety officer, Stephen Allen-Tidy who has completed SSIP Assessor training in order to fulfil our obligations as an SSIP Registered Member. New NASC full membership certificates have been designed incorporating the SSIP logo date which will shortly be in circulation throughout the membership. NASC participated in the UEG Annual General Assembly at the Scandic Continental hotel, Stockholm on Friday 13 October 2017. 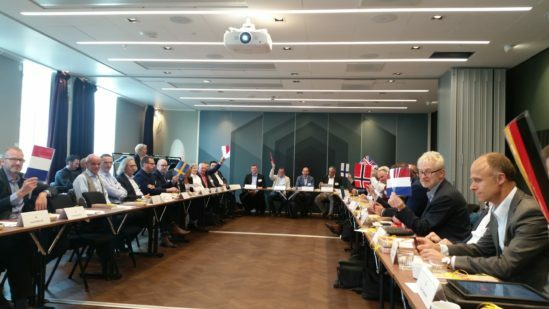 The event was hosted by the Swedish scaffolding organisation (STIB) and the event was attended by 52 delegates. UEG (Union Europaischer Geruestbaubetriebe) is the umbrella organisation for European national trade bodies in the access and scaffolding sector, and NASC represents the interests of the UK scaffolding industry on the group. UEG President Martin Angele (SGUV/Switzerland) reviewed UEG activities during 2017, noting the activities of the UEG European Regulations Working Committee and the recent publication of practical guidelines for scaffolding contractors. Herr Angele then looked forward to a full programme of activities in 2018 which would include a UEG panel discussion in June, where the focus would be on CEN TC53 and scaffolder training. He also noted that risk assessment guidelines would be developed by UEG during the year. An application for membership from the Federation des Entreprises de Construction d’Echafaudages (FECEL/Luxembourg) was approved at the assembly, bringing the total number of national organisations represented on UEG to ten. Additionally there are ten UEG associate members representing principal supplier organisations in Europe. Further applications for both UEG membership categories are anticipated in 2018. Next year’s UEG General Assembly will take place on 12 October 2018 and will mark the tenth anniversary of UEG since the inaugural assembly took place in Potsdam in 2008. NASC is a founder member of UEG. Leading industrial trainer, AIS Training is expanding its global reach after opening a training centre in Vietnam. The state-of-the-art centre, which will be run in conjunction with AIS Training’s partner in the territory Black Cat Insulation Technical JSC, will offer internationally-recognised scaffolding and insulation courses. AIS personnel carried out their own intensive seven-day audit, prior to the successful CISRS accreditation visit. The centre has now been accredited by global scaffolding body, CISRS as an official overseas scaffolder training scheme (OSTS) centre and is approved to offer a range of CISRS courses including Level 1 Scaffolder, Basic Scaffold Inspection and Scaffolding Supervisor training. The new training centre will be used by Black Cat to upskill and improve the competencies of its own employees, as well as servicing the training requirements of the lucrative Indo-China oil and gas and construction markets. 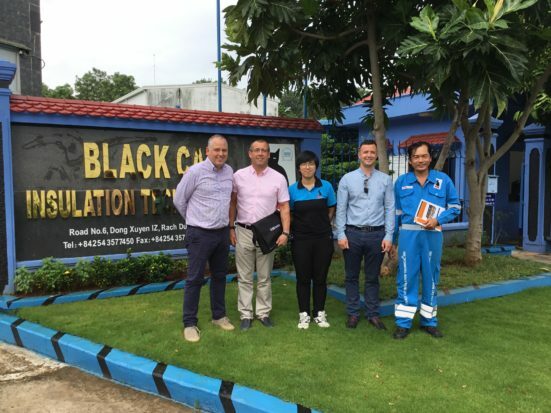 Black Cat employs around 200 people in Vietnam and is well-recognised as a key supplier to the Indo-China oil and gas and industrial sectors providing and installing insulation, protective coatings and passive fire protection systems via scaffolding. This move will strengthen the existing business relationship between AIS and Black Cat. Currently Black Cat acts as agent and distributor throughout Indo-China for AIS’s award-winning technical insulation products, which are used to protect machinery and structures from corrosion, weather, noise and temperature extremes. Paul Attrill, Director at AIS, said: “We are delighted to establish this new state-of-the-art training centre in Vietnam and are pleased to now be part of the CISRS Overseas (OSTS) Scheme. This is a great achievement for AIS and Black Cat in raising standards. “Current skills training in the area adheres to local standards but there is a real drive by Black Cat to bring skills and competencies in line with UK standards – which are globally acknowledged as being the highest quality available. “Over the past twelve months AIS Training has developed its own world-class scaffolding centre in the North of England and we intend to replicate this success in Vietnam. Dave Mosley CISRS Scheme Manager said “Congratulations to AIS and Black Cat on gaining CISRS OSTS accreditation in Vietnam. They have a great facility and with the support and expertise of AIS UK Instructors I am sure they will be very successful. The introduction of CISRS OSTS is a major step forward for the scaffolding sector in this region. 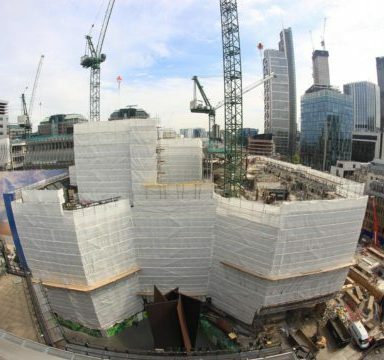 For further details on the Construction Industry Scaffolders Record Scheme (CISRS), please visit www.cisrs.org.uk or email enquiries@cisrs.org.uk. NASC and CISRS will be exhibiting at the Build Show 2017, October 10-12, at the NEC Birmingham – part of the multi-award winning UK Construction Week, which attracts 30,000 people and 650+ exhibitors under nine shows. The Build Show (aka ‘the show for people who build’) section of the UKCW event is one of the largest and attracts thousands of construction industry professionals looking for solutions and the latest innovations. And the NASC and CISRS stand is set to be a major pull to event delegates – with a vast array of free information and industry-leading guidance on offer. Attendees at the event will not fail to spot the NASC and CISRS stand (B638) – as a 3.0m tall independent scaffold tower is being constructed by NASC members TRAD Midlands Scaffolding Contractor, using the innovative Plettac Metrix modular scaffold system. For each of the three days of the event, NASC and CISRS staff – as well as leading member company experts from the scaffolding and training sectors – will be on-hand to discuss the latest access and scaffolding guidance, changes to the CISRS scaffold training scheme (including the recent introduction of CPD), benefits of NASC membership and more. The confederation will also be conducting live demonstrations of the enhanced TG20:13 eGuide Version 1.2 – released just a few weeks prior to the industry event. And staff will also be showcasing the new NASC membership audit and application process, now accredited to SSIP, as well as free to download guidance and publications, the 2017 Safety Report, latest NASC Yearbook, CISRS CAP 609 and more besides. 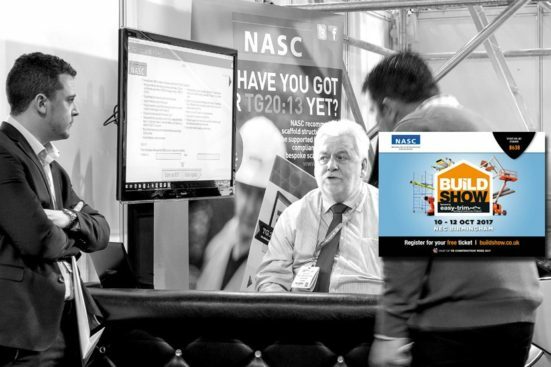 NASC members Turner Access Limited and Palmers Scaffolding UK Ltd will also be exhibiting on separate stands at the Build Show event, close to the NASC and CISRS stand – creating a scaffolding and access section of their own at the Build Show. Robin James NASC Managing Director, said: “We came to the inaugural UKCW event last year, to see what it was all about and quickly realised it was going to be ‘the place to be seen’ – attracting a huge amount of traffic and extremely well run and promoted. The mix of exhibitors, expert speakers, wide range of workshops and excellent venue is an extremely attractive cocktail for those who attend – and for those wishing to promote their brands. 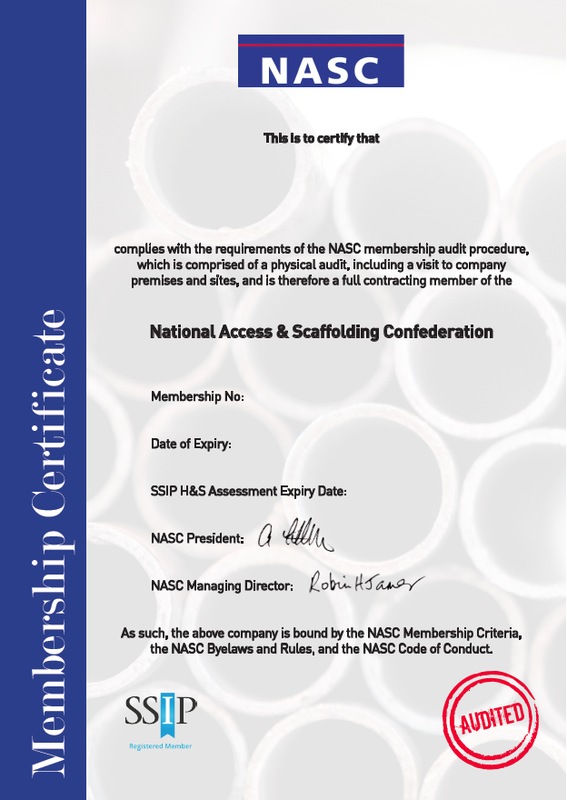 For details on the new SSIP-accredited membership application process, copies of recently published, industry-accepted, free to download guidance (except TG20 Suite publications & Pocket Guides) and for information on the NASC – the national trade body for access and scaffolding in the UK – including how to become an NASC member, please visit www.nasc.org.uk or email: enquiries@nasc.org.uk. UKCW is free to attend, by registering here.